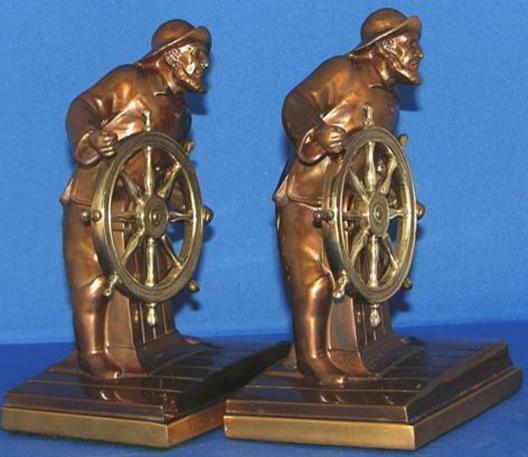 “At the Helm” — Ronson - Circa 1930. Gray metal finished in “Colonial Bronze,” medium bronze effect combined with copper-colored highlights. Measures 7 high x 4-1/2” wide x 3-1/4” deep. Weighs 6 lbs. the pair. No inscription. Paper tag long gone. Original felt on one, replaced felt on the other. The finish is 99% intact. 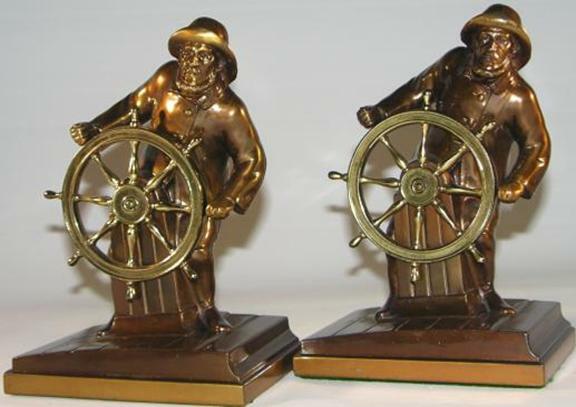 The 1938 Ronson catalog describes, “a wonderfully lifelike rendition of a sea faring man at the helm.” A fantastic pair of bookends in outstanding condition.